Creamy, chocolaty, sweet—and it can fit into a smart eating plan. What's not to love? 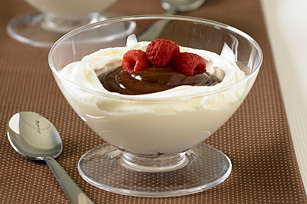 Spread 1/3 cup COOL WHIP onto bottom and up side of each of 6 dessert dishes. Beat pudding mix and milk with whisk 2 min. Spoon into center of COOL WHIP in each dish. Garnish with fresh berries just before serving.